Dromedary Camel also called the Arabian camel (Camelus dromedarius) is a large, even-toed ungulate (hoofed animal) with one hump on its back. Their coats can range from dark brown to a much lighter sandy beige colour, and hair is concentrated more on the neck, hump, and shoulder. The male dromedary has a soft palate, called dulaa in Arabic, which it inflates to produce a deep pink sac. This palate is often mistaken for the tongue, as it hangs out of the side of the male's mouth to attract females during the mating season. Dromedaries are also noted for their thick eyelashes and bushy eyebrows. The hump, which can be 20 cm (7.9 in) tall or more, is made up of fat bound together by fibrous tissue. The dromedary has long and powerful legs with two toes on each foot, which resemble flat, leathery pads. Unlike many other animals, camels move both legs on one side of the body at the same time, giraffes also move like this, which results in a swaying motion. They can adapt their body temperature from 34°C to 41.7°C, to conserve water. 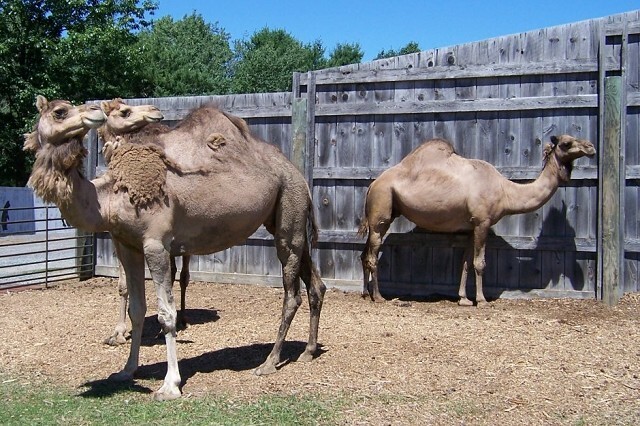 The dromedary camel exhibits sexual dimorphism, as both sexes are quite different in their appearance. They have sharp eyesight and a good sense of smell. The cranium has a well-composed sagittal crest, long facial part, and an indented nasal bone. They have an average lifespan of 40 years, which can be extended to 50 years in captivity.